The Apple MacBook Pro 2018 in Australia comes with an identical design of 2017’s MacBook Pro. But overall it’s an attractive Machine of 2018 so far. The solid block of Aluminum is normally decorated with an insightful Apple logo on the lid. The bezels around 15.4-inches are slim compared to 2016 and 2017 models and competitors such as Dell’s XPS Line. There are massive Touchpad and Speaker grilles on both sides on a keyboard and the function row is replaced with OLED Touch Bar. Do you love it, or hat it? The dimensions are 13.8 x 9.5 x 0.6 and weigh only 4 pounds, making MacBook Pro 2018 with Touch Bar lighter compared to competing Notebooks and of a comparable size. Taking a start from MacBook Pro 2018 with Touch Bar’s display, it’s measuring 15.4-inches crisp and bright display with True Tone Technology offering high-quality images even beyond your expectations. Based on several online tests, 2880 x 1800 Pixels screen out on a 4K documentary from Evolve wrestling promotion where performers are rendered so clearly like you’re in the front row. Apple says. MacBook Pro 2018 is backed by advanced multichannel sensors in order to adjust colours and intensity of the screen. The 3rd generation butterfly keyboard in MacBook Pro 2018 is an incremental improvement over 2017 models which was an even little improvement over initial keyboard launched in 2016 MacBook Pro. Apple has claimed that it’s quieter and has slightly softer-feeling feedback for each key press. Performance-wise, Apple MacBook Pro 2018 with Touch Bar houses an Intel Core i7 CPU Turbo Boost Up to 4.3GHz with 9MB L3 Cache and 16GB of RAM which combines for blindingly fast performance. According to Geekbench 4 general performance test, MacBook Pro 2018 posted a massive score of 23,138 compared to 11,318 premium notebook average. The upgraded Touch Bar MacBook Pro with a new and proprietary chip named T2 enabling such security measures as an encrypted SSD and a secure boot process. 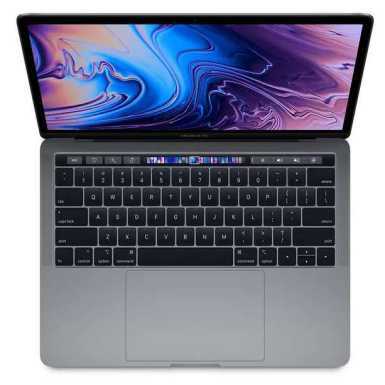 The Apple MacBook Pro 2018 512GB Touch Bar Price in Australia starts from 3350-3400 AUD with 15” screen, 16GB of RAM and Intel Core i7 Processor. 256GB SSD variant with 16GB of RAM and Intel Core i7 Turbo Boost Up to 4.1GHz and 9MB shared L3 Cache set users back around AU$2500-2550. Be noted that one thing which pushes the price to this sky-high level is that 4TB hard drive. In short, adding a massive storage leaves a dent on your wallet but do you really need that much amount of storage?